At SMX West, Matt Cutts spoke about the latest Panda changes, and mentioned that the algorithm update had matured. He explained that Panda will now roll out monthly, but slowly over a 10 day period. Previously, Panda would roll out every 4-6 weeks and the rollout would be relatively quick (all in one shot). 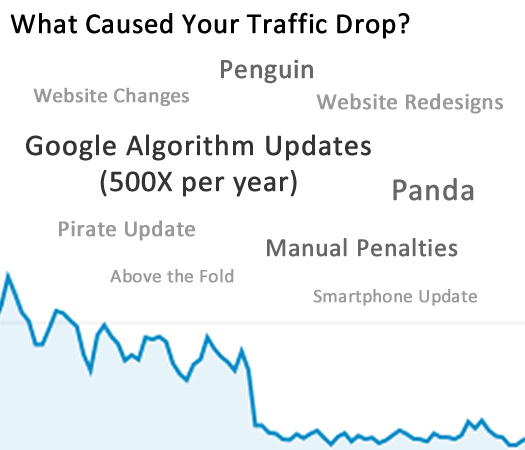 In addition, Google used to confirm that a Panda update occurred, which meant that massive traffic drops could be tied to Panda. The upside to the previous approach was that webmasters and SEOs knew when a website was hit by Panda and could begin to analyze their websites through a Panda lens. Although it’s tough to diagnose exactly why a site was hit by Panda, knowing that the site was indeed hit by Panda was extremely helpful. So, what does the new Panda rollout mean for webmasters that were hit, or SEOs trying to diagnose the situation? It means their jobs just got a lot harder. Let me explain. Let’s revisit what I was explaining about previous Panda updates. Panda would roll out, webmaster chatter would spike, Barry Schwartz would pick up his bat phone and contact Google, and representatives from Google would confirm the update. At that point, webmasters knew they were hit by an official Panda update, SEOs knew the site had a quality issues, and they could map out a plan of attack to push back the mighty Panda. The new Panda will roll out once per month (cool), but will take up to 10 days to fully roll out (uncool). That means a website could be hit and feel the wrath of Panda at any point during the rollout. That makes diagnosis much harder. It’s like going to the doctor with a sore knee 10 days after it happens, but you played basketball, lifted weights, moved furniture, ran a half marathon, got kicked in the knee by your nephew, and fell down the steps during that 10 day period. Which one of those incidents caused the knee problem? It’s hard to tell, and that’s my core point. Google updates its organic search algorithm approximately 500 times per year. Yes, 500. In addition, there are other algorithm updates that are pushed out at specific times, like Penguin, Pirate, Above the Fold, the upcoming Smartphone update, etc. And in addition to that, there are manual penalties where Google specifically takes action on a site that’s violating its webmaster guidelines. And to make matters even more complex, website owners are making changes all the time. Redesigns occur, CMS migrations take place, new functionality is added to websites, optimization changes, new pages are added, etc. The main point is that isolating a specific date for a massive traffic drop is critically important (and knowing that date matches with a major algo update). In the past, having a specific date for an update as powerful as Panda was a good thing, while rolling Panda out over 10 days leaves a lot of room (and time) for other factors to be introduced (which could skew your analysis). And that makes diagnosis tougher, and it also makes recommendations for changes tougher. The more variables you add to the mix makes the situation exponentially more complex. And that’s especially the case with Panda, which I’ll cover in greater detail next. Whenever business owners call me about a potential Panda or Penguin hit, I often have to explain the differences between the two. For many outside of SEO, the two might seem synonymous, when in reality, they are extremely different animals (pun intended). Penguin is extremely acute (for now). It hammers unnatural links, and eats them up faster than a good piece of fresh fish. Panda, on the other hand, targets low-quality content. And that can mean a lot of different things, depending on the site. I’ve done a lot of Panda work since February of 2011, and I’ve seen a number of content-related problems that caused Panda to stomp all over a website. For example, thin content, duplicate content, affiliate content, cross-linking of domains, low engagement pages, etc. all causing Panda issues. Even if you knew a website got hit on a certain date, and that was in fact a Panda update, then you still didn’t have a 100% clear understanding of what to actually change. That led to this post by Google’s Amit Singhal, which listed 23 questions you should ask yourself about your website (if you were wondering what to change after being hit by Panda). For many, those questions were hard to answer. So, factors leading to a Panda attack were hard to diagnose in the past (since it could be one of many characteristics of a website, or a combination of those). But now, it gets exponentially harder. You won’t know 100% that a site was hit by Panda (since it will roll out over a ten day period). Webmasters will undoubtedly be extremely confused by the drop. And then SEOs will be tasked with diagnosing the drop, identifying potential Panda problems, and then making tough recommendations for refining the site in question. Remember, you don’t want to be caught in the grey area of Panda, or you’ll never recover. Personally, I’m extremely aggressive with Panda recovery tactics. There’s a grey area that is very dangerous for business owners. If you don’t refine enough of your site after getting hit by Panda, then you’ll stay in the grey area. If you stay in the grey area, and Panda rolls out again, you won’t recover. And to make matters even tougher, you won’t have any idea how close you were to the light at the end of the Panda tunnel. That’s madness… which is why I aggressively attack a Panda situation. I’d rather have a client recover from Panda, and then build upon that foundation, versus having them sit in the grey zone of Panda madness (never knowing how close they are to recovery). The latest Panda advancements make the process of attacking Panda potentially harder for many webmasters. When providing my recommendations for refining a website hit by Panda, I’ve had clients scream out, “are you crazy”, “WTF”, “no freaking way”, “are you sure this is the right route?” etc. That’s until they calm down, review their analytics reporting again, and their financials. Once they realize they want/need to recover, they are more open to attacking the problem aggressively. Well, now that you won’t know 100% that a site has been hit by Panda, then it could make the recovery roadmap harder to get approved and execute. And that could drag out changes longer than in the past. And that can mean businesses get caught in the Panda grey area more often. That could mean that more sites will sit without recovering than in the past. And believe me, I know how painful it is to be hit by Panda. I’ve helped a number of companies with Panda attacks. Just ask a company I helped recover from Panda after six long months of refining the site. Now that I’ve explained the situation with the new Panda rollout plan, I’d like to list a few things you can do to deal with the latest Panda advancements. Take a hard look at your website now, and preemptively attack the situation. Some webmasters know they are doing things wrong… they have a lot of thin content, duplicate content, affiliate content that’s low quality, etc. I wouldn’t wait for a Panda hit. I would act now. Analyze and annotate your analytics reporting. Make sure you know exactly when you were hit, what changes might have occurred recently that could have caused that drop, and use annotations in Google Analytics to document them. This will only help the SEO that’s going to assist you. If you see a large drop in rankings and Google organic traffic, and you believe it could be due to Panda, then have a technical SEO audit conducted. I’ve said for a long time that SEO audits provide the most bang for your SEO buck. A comprehensive audit could reveal many problems associated with your website, including factors that could have led to a Panda attack. Be aggressive with your Panda recovery plan. If you determine that Panda was the culprit, don’t sit in the grey area like I mentioned earlier. Be aggressive with your Panda recovery roadmap. 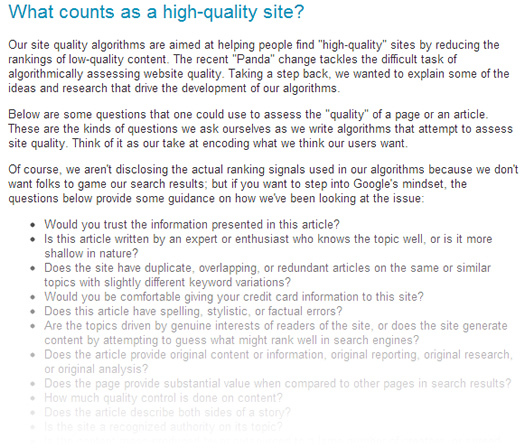 Identify low quality content, gut it, or revamp it. Be objective, look at engagement numbers, and listen to your SEO (as long as it’s the right SEO). 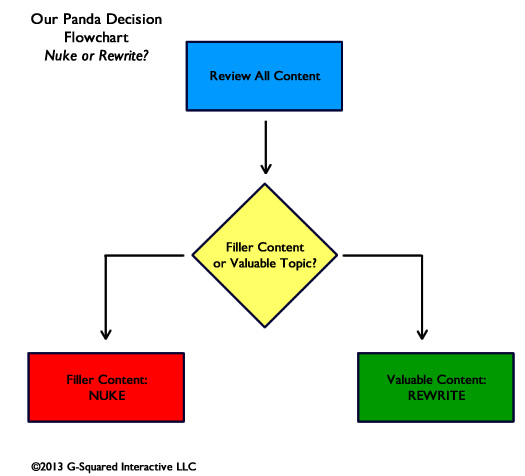 You might end up removing a good amount of content if you have a serious Panda issue. That’s ok, but you need to act. As someone that’s neck deep in SEO, I’m fascinated by algorithm updates. And that’s especially the case when you watch one (like Panda) move from a manual push to quasi real-time. That said, I know the confusion this change is going to cause. Heck, the old Panda caused confusion, and that’s when it rolled out during a specific time, and Google confirmed it. Now it can hit websites every month, over a ten day period, and Google won’t confirm the update, which means webmasters and SEOs are going to have a heck of a time determining what happened and what needs to change. I’ll end this post by saying that I don’t think Panda has fully matured yet. The situation could progress to real-time, where Panda rollouts occur arbitrarily throughout the month (as your site gets recrawled). And if that’s the case, webmasters and SEOs will be in a Panda warzone. So I hope you’re stocked up with bamboo. This could get ugly.